As some of you may know, I’ve recently taken on a new job at a local winery in Indiana – Oliver Winery. Why wine and not cider? Well, Oliver does happen to make some ciders, and as the oldest and largest winery in the state of Indiana, right down the road from where I currently live and am attending grad school, it seemed like the best choice and a really good opportunity to get more insight into the wine and cider business here in the United States. Plus, they were hiring right when I needed to find a job. So this blog may begin to take on the world of wine as well as cider. I was hired to work in the tasting room, and I have been happy also to find my way into some work in the vineyard as well. Let me just say, that up until now, I have enjoyed wine, but have known very little about it. My introductory training at Oliver has opened up a whole new world of the grape! Southern Indiana, it turns out, has some great advantages as a wine growing area. Our upland landscape has some ideal topogaphy for drainage, and we get enough sun and heat in the summer to support some good growing conditions. Oliver makes over 40 different wines, some from grapes imported from other growing regions in the US, and some from its own Creekbend Vineyard, where I am also now working. Some of my favorites at the moment are the Chambourcin, Zinfandel, Cabernet Sauvignon, Chardonnay, and Traminette, and Vignoles. Let me just say that our training was wonderful, thorough, and very fun (but very responsible!). In the tasting room, we have to be able to describe and discuss all of these wines for customers, so we really do have to know how they taste, and how they are made. And customers are many! On a weekend, there are usually at least five people behind the tasting bar at all times, not to mention many other staff on the floor, at the registers, and behind the scenes. Thus far, I am really impressed with Oliver as a company – they seem really dedicated to treating customers and staff really well. My time out in the vineyard has just started, but I am so glad to be able to spend time working in an agricultural setting – this is one of the things I love about cider and wine – the connection these drinks have to their agricultural source. Working out in the landscape is so rewarding. 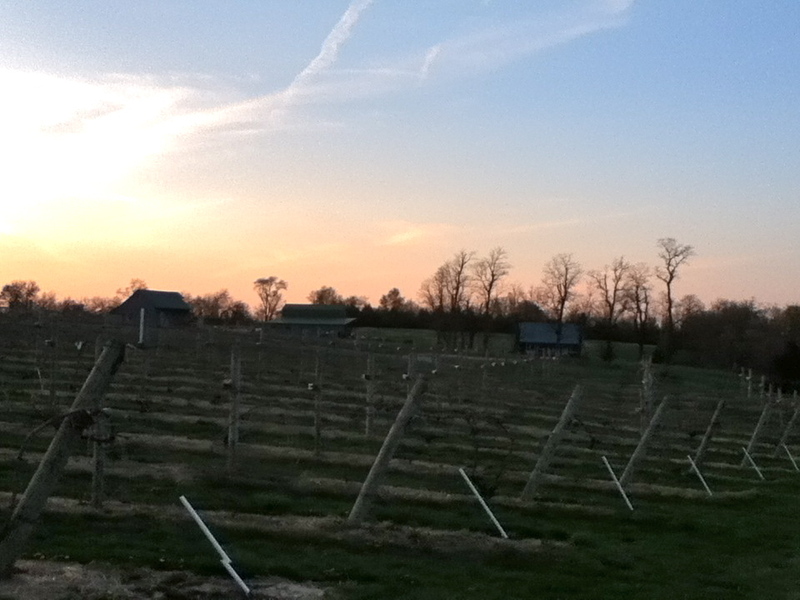 On my first day, I spent all day pruning and tying vines. And today, I spent most of the day digging holes and planting replacement vines with some wonderfully friendly and fun co-workers. We’ve had very cool wet weather interspersed with some tantalizing warm sunny days. Many of the vines are breaking bud, and it it quite exciting to think that they will soon begin to leaf out. I’m learning little tidbits about wine grape cultivation along the way, and I hope to keep learning more. As much as I miss the orchards in Herefordshire, I am really happy to have found my way back out in the fields here in Indiana, contributing to the alchemy of fruit growing and fermentation. Meanwhile, my dissertation has been on the backburner – moving back to the States, getting this new job, training, and starting in both capacities at the tasting room and the vineyard have taken up a lot of my time for the past two months. (As well as some academic tasks like attending some conferences, writing reviews for journals, and submitting paper proposals for more conferences). In addition, I’ll be teaching a summer course at the University during May and June, which has diverted time and energy into preparation for that task. However, I have been reading and picking up new books on the dissertation subject. Some interesting readings on Cider and the English Landscape are on my desk, and I hope to share some thoughts on these as I work through them. Stay tuned!